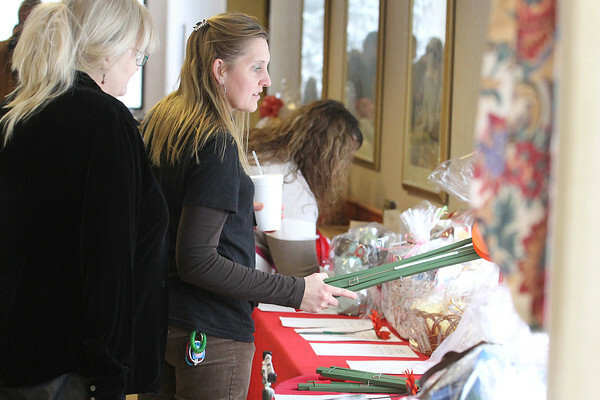 Grand Traverse Pavillions staff members Cindy Fallick (cq), left, and Stephanie Bucknam (cq) look over silent auction items during a fundraiser Friday for staff member Shayna Sanor (cq), who is battling leukemia. Staff, vendors and the community donated nearly 130 items for the silent auction, and a bake sale featured hundreds of baked goods. Sanor, a human resources assisant, has worked at The Pavillions since 2006. "We really are a big family here, we take care of our own," said chief operating officer of support services Rob Barnes. "This is common for us."